Erin MacKeen, Tim Noonan, Deirdre Tara Whelan, Robert Chandler, Lee Lamothe, Y.M. Whelan, Peter Templeman, Alice Burton, Seo Eun Kim, Christopher Kier, Tim Deverell, Kathryn Bemrose and Joe Rosenblatt. 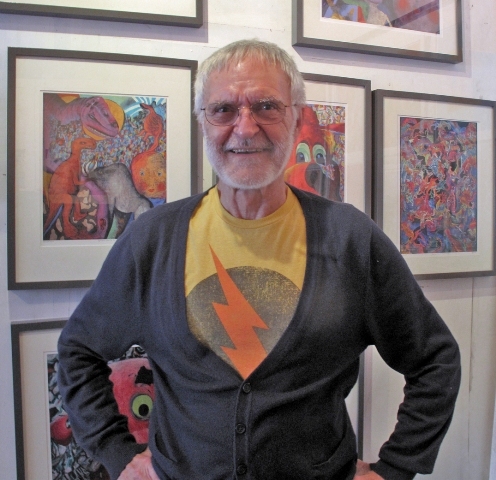 An exhibition of recent paintings by Toronto artist Robert Chandler. Robert Chandler, Tree Begins, 2018, acrylic on canvas, 16x12 in. 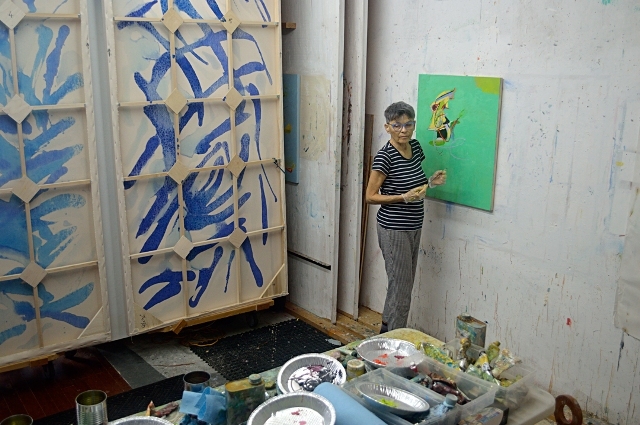 Seo Eun Kim in her Studio, 2018. Seo Eun Kim, Strained #11, 2018, acrylic on canvas, 30x20 in. 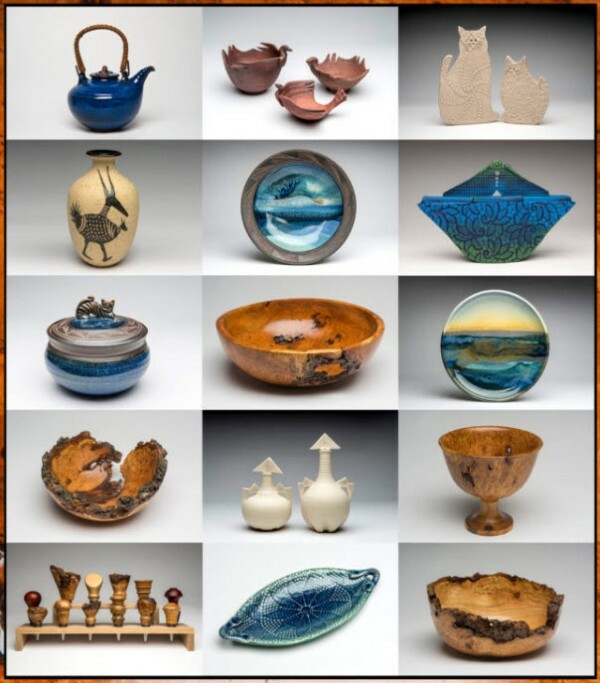 Summer Salon : Curated by William Huffman. Featuring prints, drawings and sculpture from the Cape Dorset Inuit Artists Inuit Art Collective alongside a selection of works from yumart gallery artists. 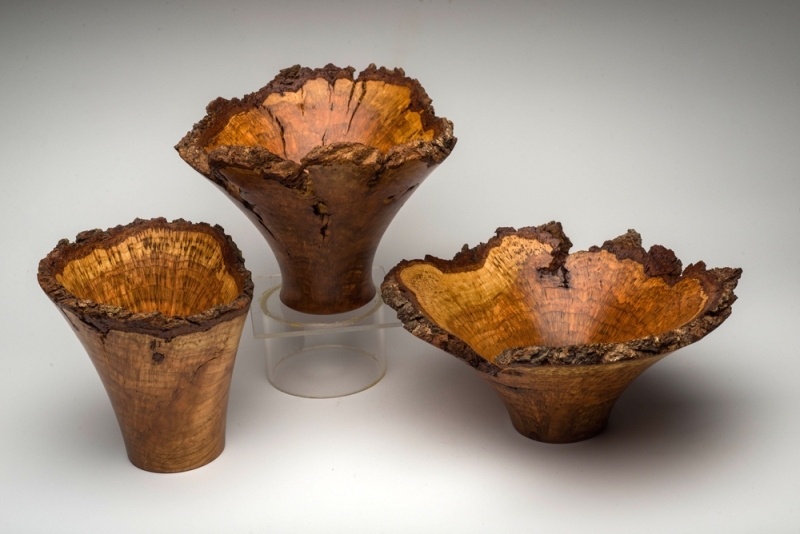 Dorset Fine Arts was established in 1978 as the marketing division of the West Baffin Eskimo Cooperative. Located in Cape Dorset, Nunavut, the cooperative is unique for its focus on the development of the arts and artists in the community. Among the many initiatives undertaken by Dorset Fine Arts is the annual release of its print collection. Each year, since 1959, the launch of this original print compendium has been highly anticipated, particularly the stonecut and lithographic works. The cooperative proudly represents the many acclaimed stone sculptors and graphic artists who are responsible for the distinctive aesthetic created at Cape Dorset’s Kinngait Studios, the oldest art print shop in Canada. 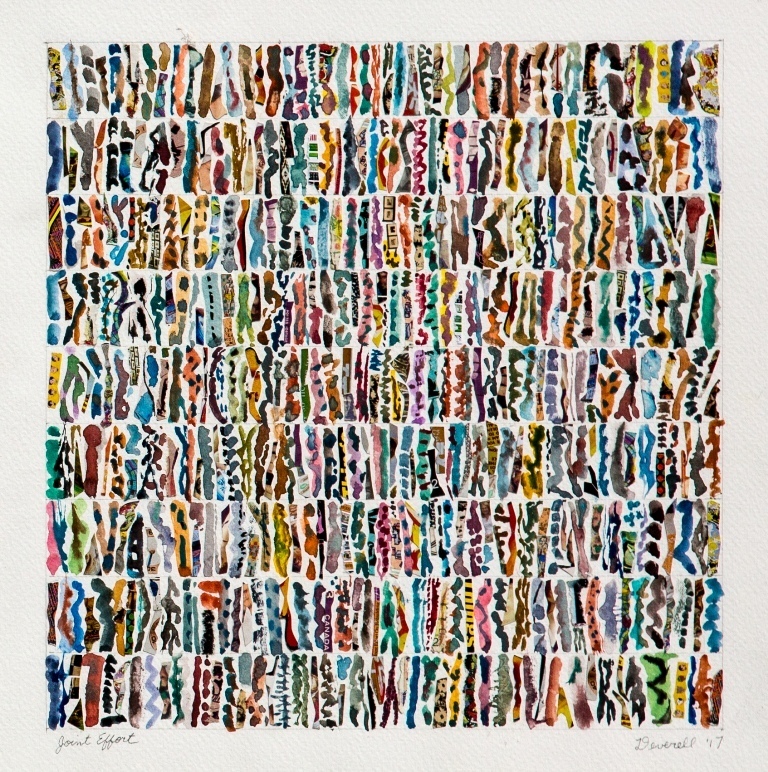 Sales and exhibitions of prints, drawings, and sculptures are generated through the Dorset Fine Arts offices in Toronto to galleries internationally. 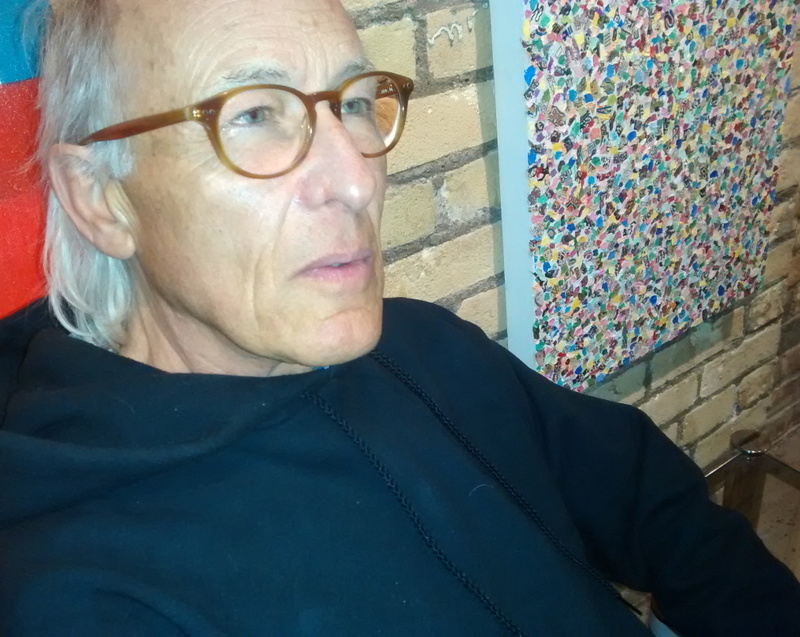 Works on paper by renowned Canadian poet Joe Rosenblatt. 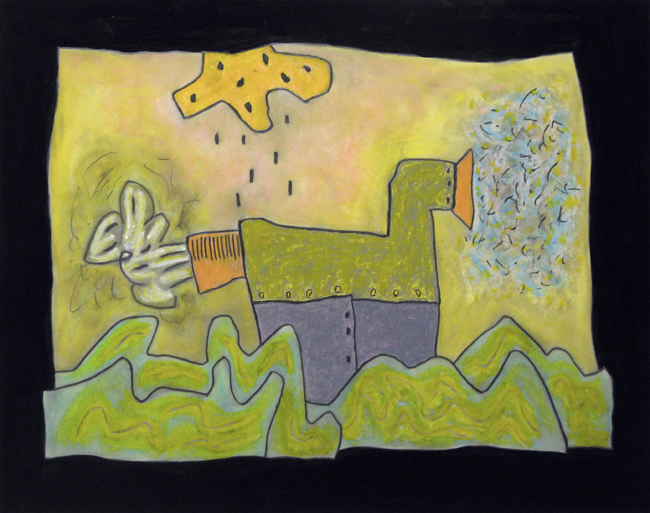 Pudlo Pudlat, Overshadowed by a Great Bird, 1985, lithograph 10/50, 22 x 30 in. 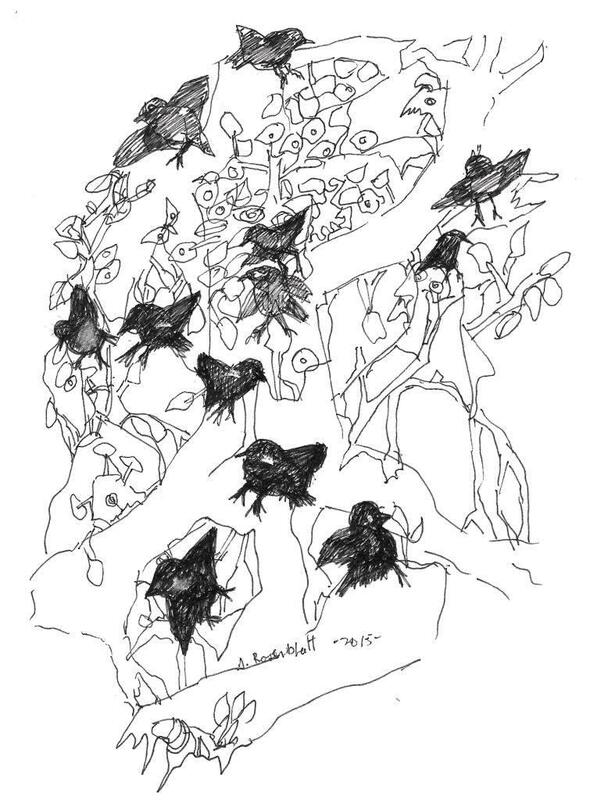 Joe Rosenblatt, Bird Love, 2015, ink on paper, 7.5 x 5 inches. "What a painting on canvas may contain: oil; acrylic in diverse colours; found fragments from printed matter; random sketches from notebooks. Chance items move toward a symmetry. 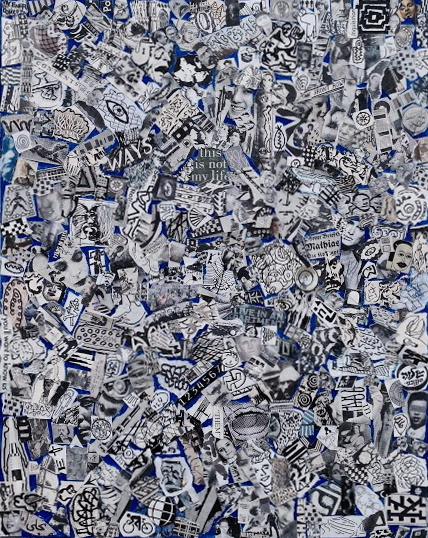 Works on paper contain gouache; watercolour; and scraps of imagery from disparate sources. Joint Effort, 2017, collage on paper, 12 x 12 in. 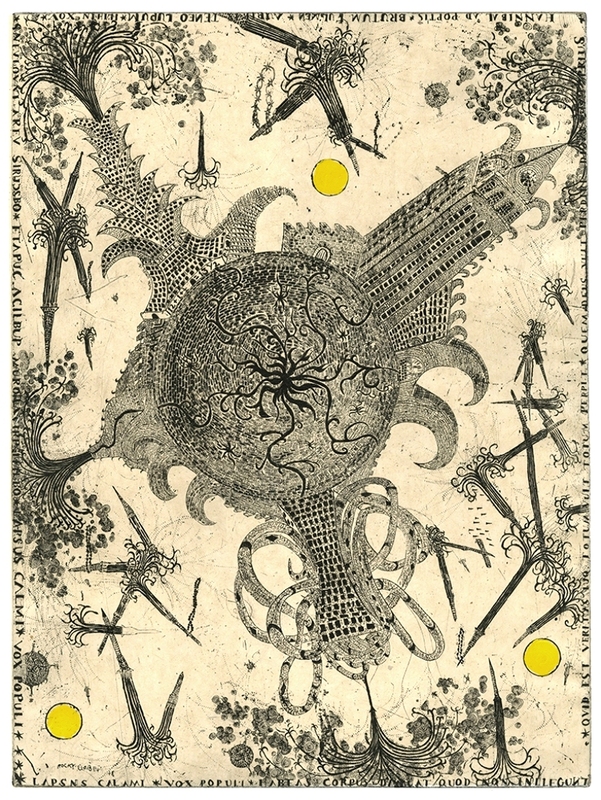 The Planet, 2018,A/P, etching, 28 x 20 in. 'Site'... a reoccurring theme in my practice for over a decade. 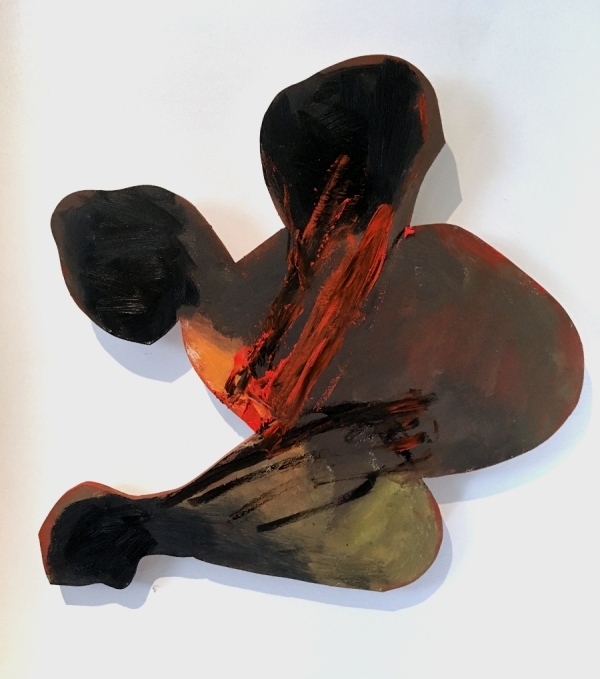 Christopher Kier, Site Series 2018-Study II, 2018, Mixed Media on Canvas, 36" x 36"
yumart gallery is pleased to present "Enticement", an exhibition of works on paper by gallery artists Alice Burton, Robert Chandler, Deirdre Tara Whelan, Tim Noonan, Lee Lamothe, Peter Templeman, Tim Deverell, Eugene Knapik, Erin MacKeen, Christopher Kier, Y.M. Whelan, Joe Rosenblatt, a.k.a. yum, and Seo Eun Kim. The exhibition will consist of a selection of works on paper in different media including painting, drawing, photomontage, printmaking and illustration. Lee Lamothe, Scream de Coupe, 2017, photomontage, 1of 3, 8 x 10 in. Deirdre Tara Whelan & Y.M. Whelan - "two sisters four"
An exhibition of new paintings and works on paper. YM Whelan, Medeiros Beach, 2017, acrylic on canvas, 16x16in. Earthbound, 2017, oil on masonite, 14 x 14 in. 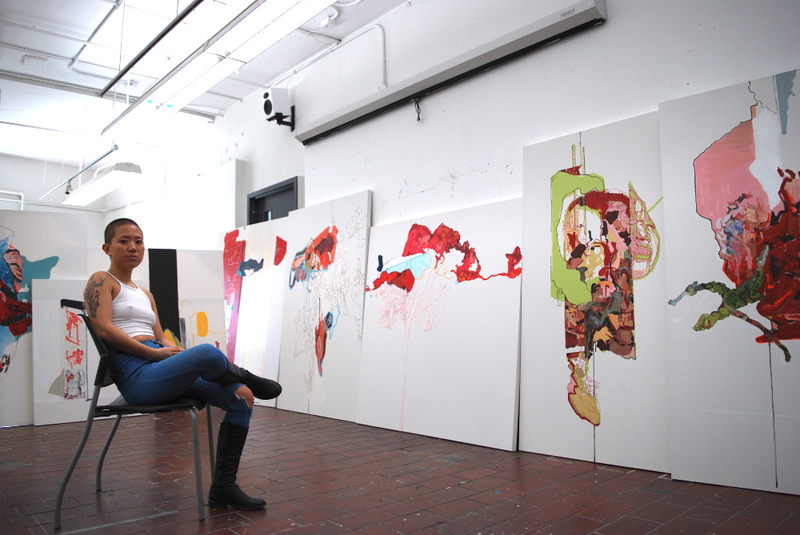 Erin MacKeen in her studio, 2017. 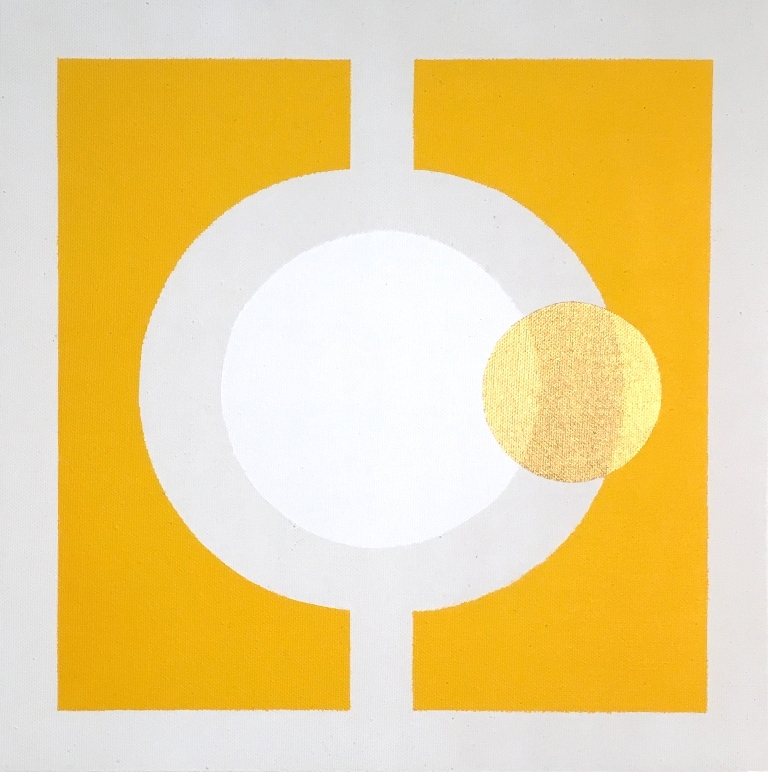 Erin MacKeen explores a minimalist approach to new paintings and works on paper with a focus on the constellation of abstracted form, colour, layer, and light. She continues to play with a lexicon of familiar shapes and geometric forms. The resulting pieces foreground the relationship between these components and decisions; the ways they are complete in their solitude, but magnificent when they become a gathering. "Source images are strained in order to separate visual texture from the whole. Human and non-human flesh become partially recognizable and fragmented, then sutured for the canvas." Review: THE ART OF SEO EUN KIM - SUN NEWS MIAMI - Sunday, June 4, 2017 by Clifford Cunningham. 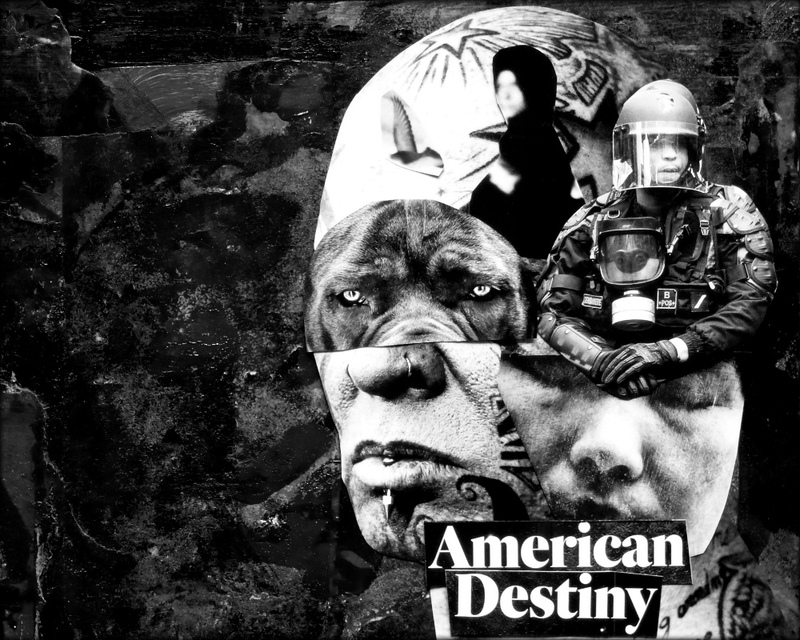 An exhibition of new photomontage works by celebrated Canadian photographer and best selling author Lee Lamothe. 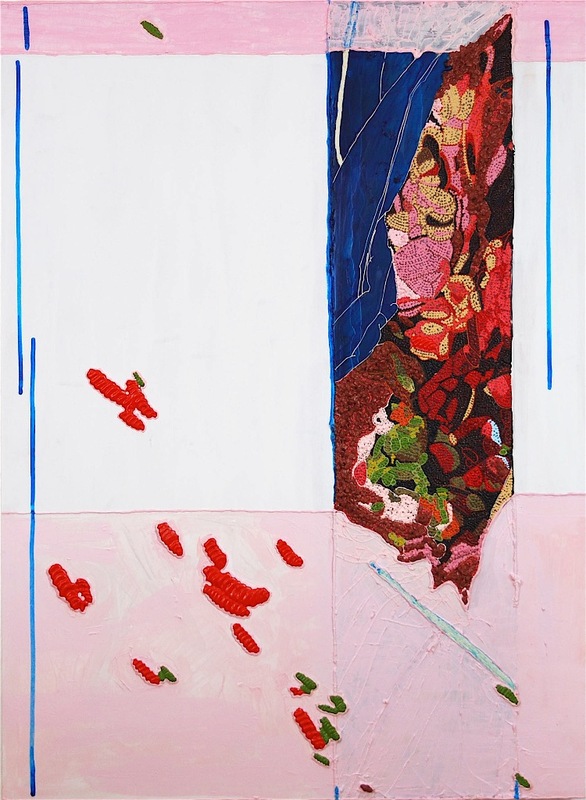 above: Seo Eun Kim, Untitled Collage #2, 2015, acrylic on canvas, 48 x 36 in. This exhibition will include three large works on canvas along with a series of signed, limited edition prints of all works in the series. 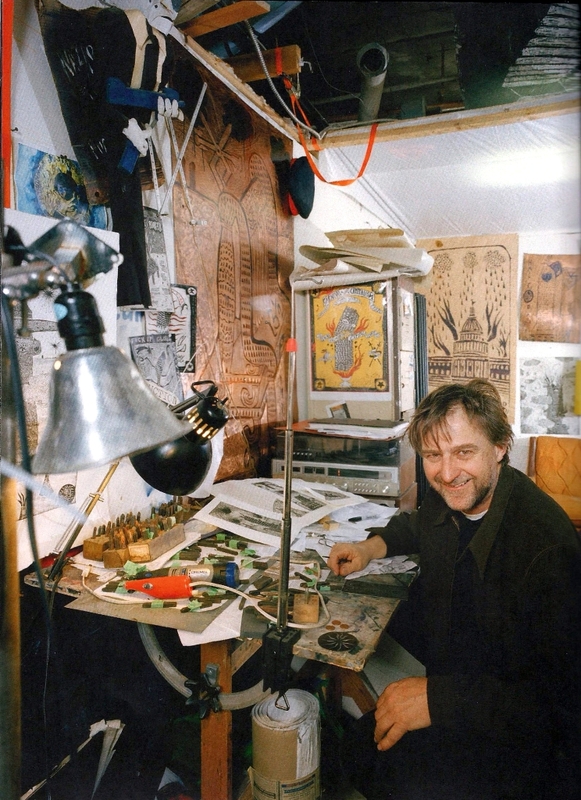 above: Claude Breeze in his studio, 2017. "Improvisation draws from experience and knowledge to create, unplanned. Spontaneity and playfulness combined with craft come together in the artwork. Painting, like life, should be experienced. The paintings in this exhibition use knives, brushes, oil colour and canvas. Painting #1 2015-2016, oil on canvas, 18x14 inches. 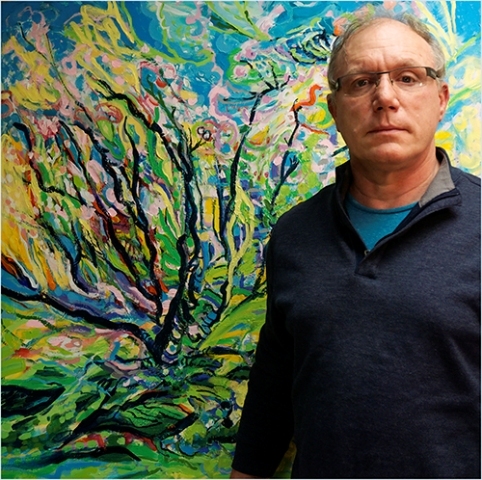 yumart gallery is pleased to present our season opener: "New Encaustics and Drawings" by Canadian artist Eugene Knapik. "The encaustics are on shaped pieces of wood, built up in layers using brushes, knives and scraping tools. 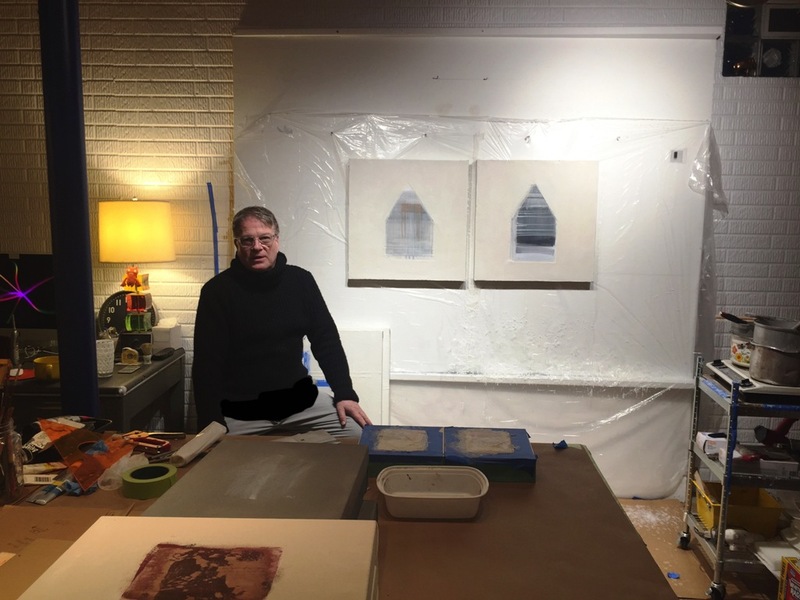 These images are layered up in a series of studio sessions, working on multiple paintings at the same time, such that ideas emerging in the various paintings inform one another. 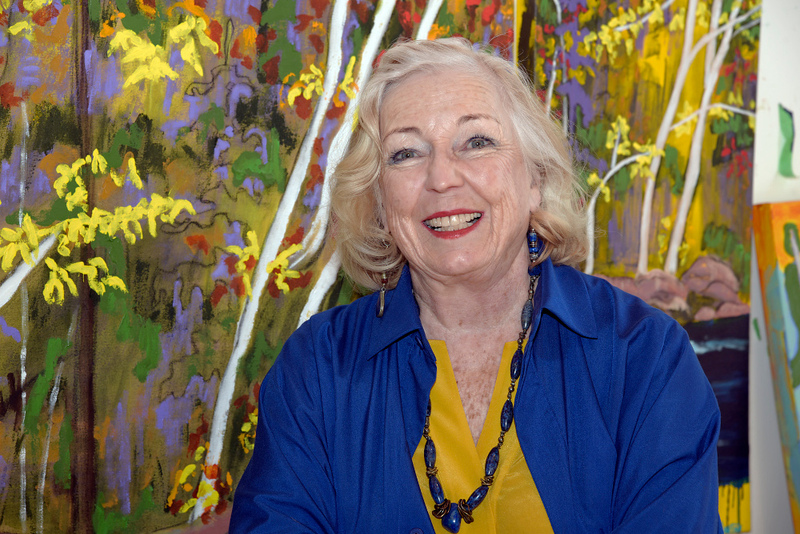 In these paintings I've continued to develop a personal or imaginary or interior painterly landscape." above: Eugene Knapik Ahoy, 2016, encaustic on carved wood, 11 3/4 x 13 1/2 in. 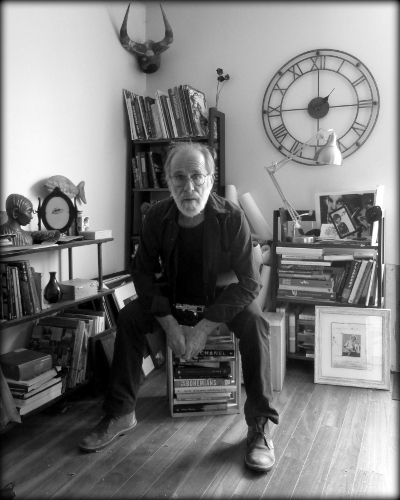 William Huffman is an arts administrator, curator, educator and writer. He is currently the Marketing Manager with Dorset Fine Arts, a division of Cape Dorset's West Baffin Eskimo Cooperative. 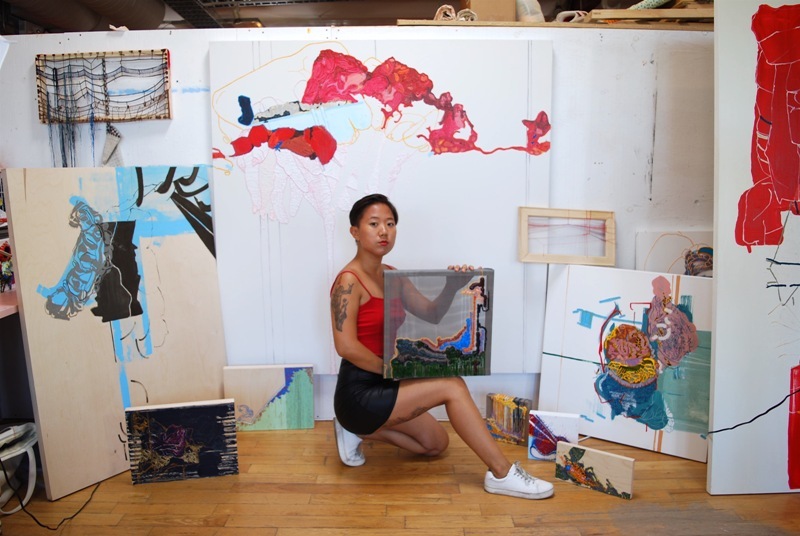 Founded in 2013, yumart is one of only two commercial gallery spaces at 401 Richmond Street - the gallery represents a roster of 12 artists working in a variety of media. 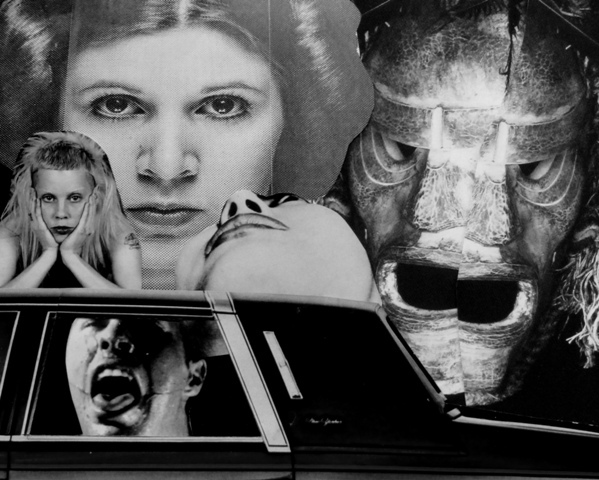 An exhibition of new photomontage works by best-selling author Lee Lamothe. 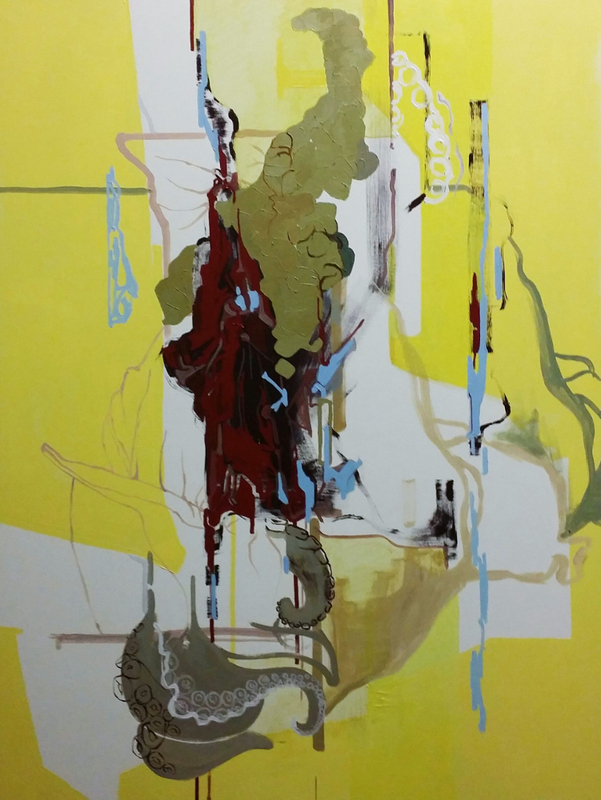 yumart gallery is pleased to present "Leviathan", an exhibition of new works on canvas by Toronto artist Deirdre Tara Whelan. Exploring archetypal imagery (the sea, baptism, emergence) and incorporating archival bookbinding thread and wire, Whelan creates delicate bas relief surfaces to tell the story of her dreams. The Net, 2016, mixed media on canvas, 18x18 inches. 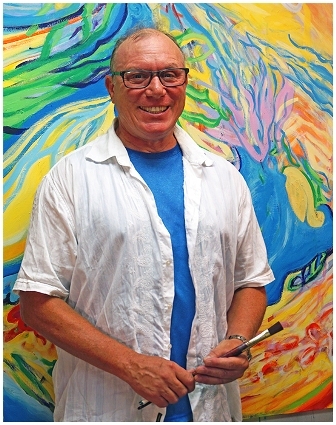 Joe Rosenblatt "Angels, Demons and Spirits"
Rosenblatt is a Canadian artist and poet who lives in Qualicum Beach, British Columbia. His "line drawings, paintings, and sketches often illustrate his own and other poets' books of poetry. He is a winner of Canada's Governor-General's Award and British Columbia's B.C. Book Prize for poetry. Born in Toronto in 1933, Joe started writing seriously in the early sixties, and in 1966 his first book, "The L.S.D. Leacock", was published by Coach House Press. Since then he has published more than a dozen books of poetry, fiction and non-fiction, complete with his own illustrations. 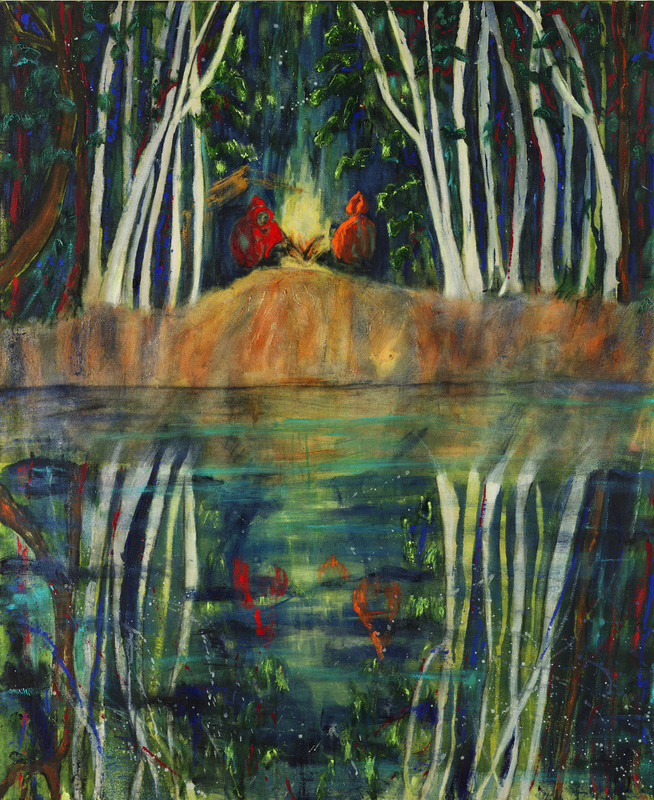 This exhibition will include drawings and paintings as well as a selection of illustrations from his latest poetry collection "The Bird in the Stillness (Forest Devotionals)" published by The Porcupine's Quill. Joe will do a reading from his new collection at the opening reception, and books will be available for sale at the gallery (cash only). 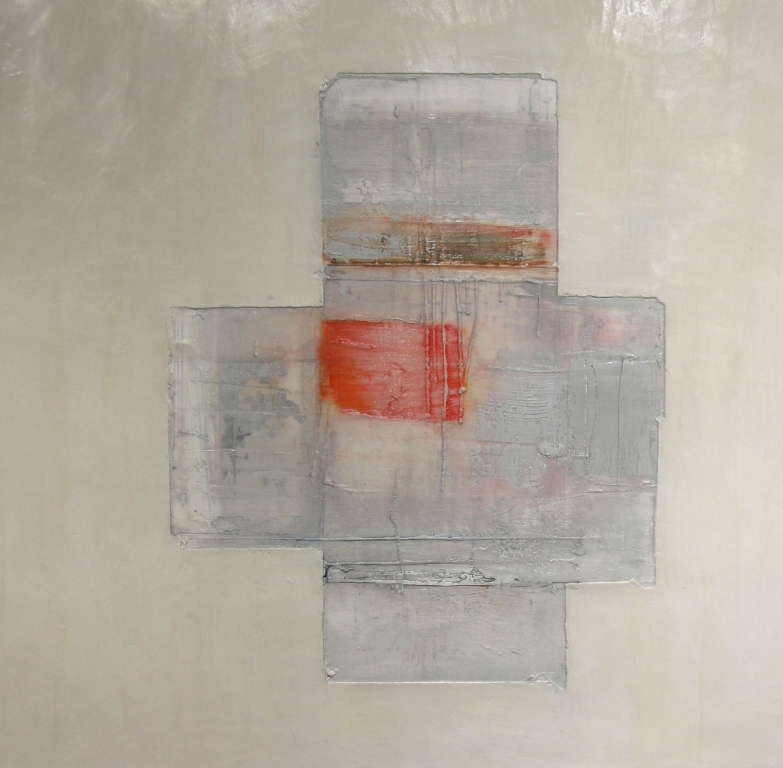 MacKeen continues to explore the delicate subtleties of line, form, and colour in minimalist abstract works on canvas and paper. Layers of hard-edge geometric shapes in carefully composed acrylic paintings play with movement, space, and surface tension. Oil pastels are used as the primary medium for works on paper that engage with similar concerns of composition in carefully ordered pictures that celebrate the constant comfort of rows. Choices, 2015 acrylic on canvas 20 x 20 in. An exhibition of photo-based mixed media collage on printed canvas with crayon, acrylic gel, and charcoal. Primarily smaller scale figurative images in a pictorial environment that are manipulated and transformed to challenge visual thinking and meaning for the viewer. Claude Herbert Breeze is a Canadian artist and Professor Emeritus at York University in Toronto, Canada. He is also sometimes known as C. Herbert. Tim Noonan "Slipping Into Abstract"
The exhibition comprises a selection of recent paintings on canvas and works on paper which reflect an innovative exploration of technique and process as related to the objective and non-objective rendering of the picture space. The works reveal an interest in developing the push/pull relationship between the figure/ground subject and the abstract manipulation of colour and brush stroke. Referencing juxtaposed aspects of both nature and the urban grid, the works display a highly focused energy and excellent colour dynamic. Stepping into Yumart's space at 401 Richmond you are drawn immediately to the far end of the gallery, where two large paintings hang both featuring a national icon, the Canadian goose, in mid flight. It is a fitting beginning ...(click on this ARTORONTO link to read the rest of the article). 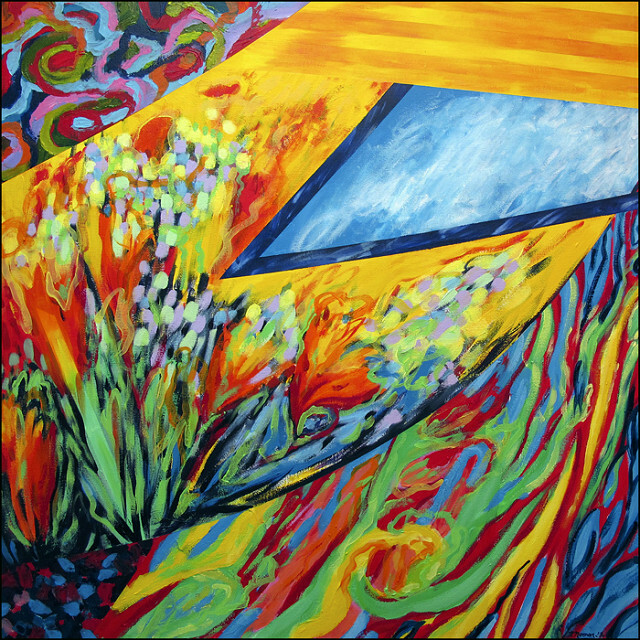 Two Geese Return To The North, 2011 acrylic on canvas 48 x 48 in. 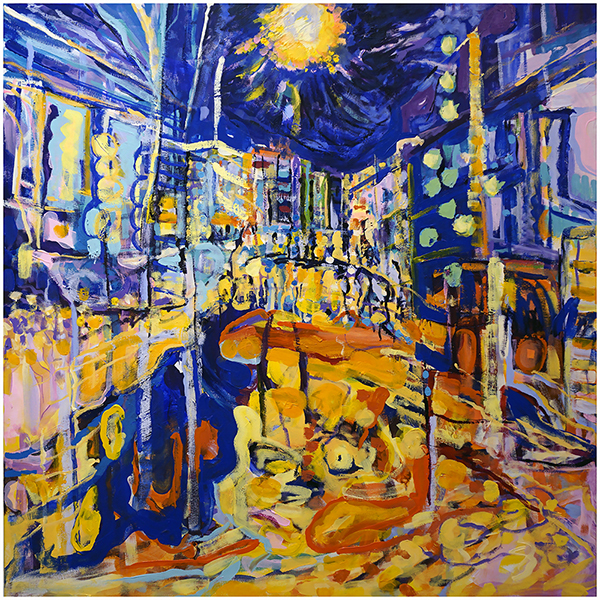 An exhibition of gallery artists Deirdre Tara Whelan, Robert Chandler, Tim Noonan, Y.M. Whelan, Peter Templeman, Erin MacKeen, Tim Deverell, Lee Lamothe, Eugene Knapik, Joe Rosenblatt, a.k.a. 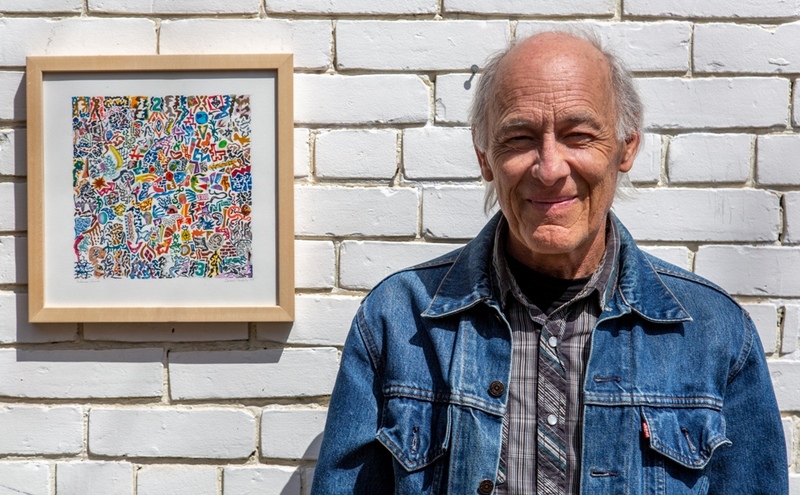 yum and Christopher Kier, showcasing works on paper, including painting, drawing, illustration, mixed media, printmaking and photography. 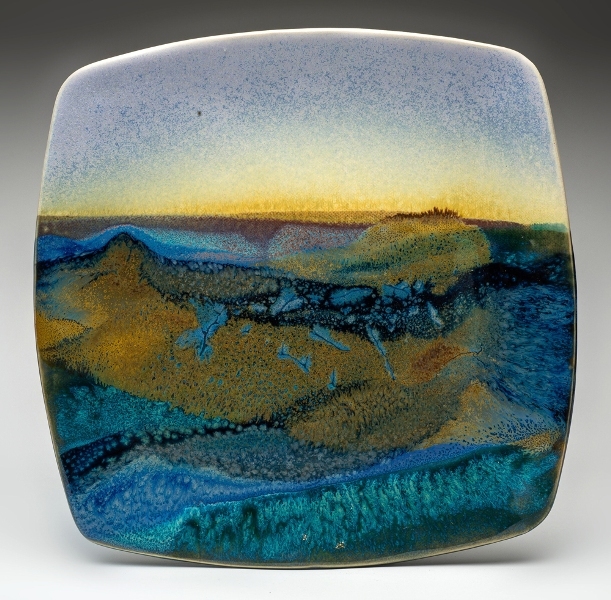 Gallery artists Deirdre Tara Whelan, Robert Chandler, Tim Noonan, Y.M. Whelan, Peter Templeman, Erin MacKeen, Tim Deverell, Lee Lamothe, Eugene Knapik, Joe Rosenblatt, a.k.a. yum and Christopher Kier are joined by guest artists Claude Breeze, Tony Calzetta, Sheila Gregory, Brent Roe, Gabrielle de Montmollin, Katharine Bemrose, Richard Bonderenko, Dawn Mourning, Wayne Moore, Larry Dickison, Sunny Kim, Karen Miranda Augustine, Beverley Rosenberg, Robert Nowacki, Mark Gerula, Raffael Antonio Iglesias, Mark Isaac, Alan Glicksman, Alice Burton and Brigitte Nowack. A fabulous eye-candy salon style hanging with 50+ works of art including painting, drawing, illustration, photography, printmaking and sculpture. 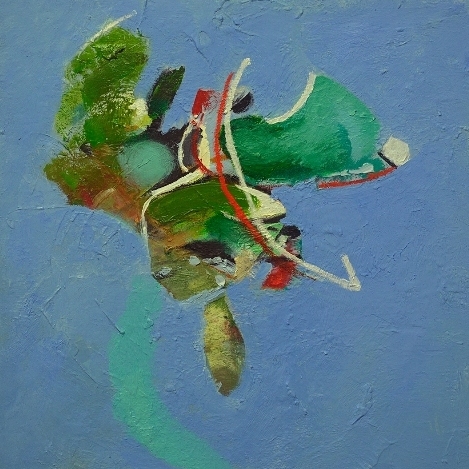 Robert Chandler - "something happened"
new paintings, abstract and not. In this current body of work, Chandler continues his exploration of line, paint and abstraction; figurative elements pit themselves against the non-figurative mark making that has been a consistent part of his art practice for three decades. (click on this ARTORONTO link to read the full article). Trouble Shall Follow, 2015, acrylic on Canvas 16" x 16"
... urban abstraction, and the follies of sport and war. "... in this current body of work, entitled "camouflage" I continue exploring architectural iconography, along with my ongoing preoccupations with place, time, and detritus. Intricate detailing from 19th and early 20th century buildings and monuments as well as design lines of mid 20th century dwellings, are utilized along with more primitive universal representations of refuge. Juxtapositions of these computer manipulated 'remnants' with clean, enveloping linear housings create a dialogue which ponders the facade of architecture and its human connection. 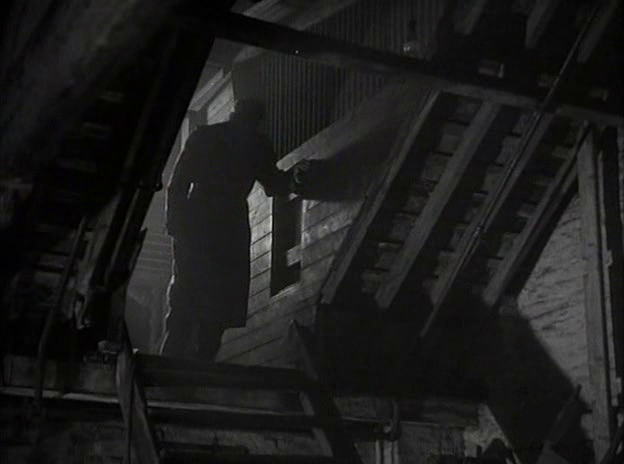 The use of disguise in shelter, what is projected outward, and what is kept protected and hidden 'under camouflage', to me creates a reliquary, an echo, or imprint worthy of investigation." 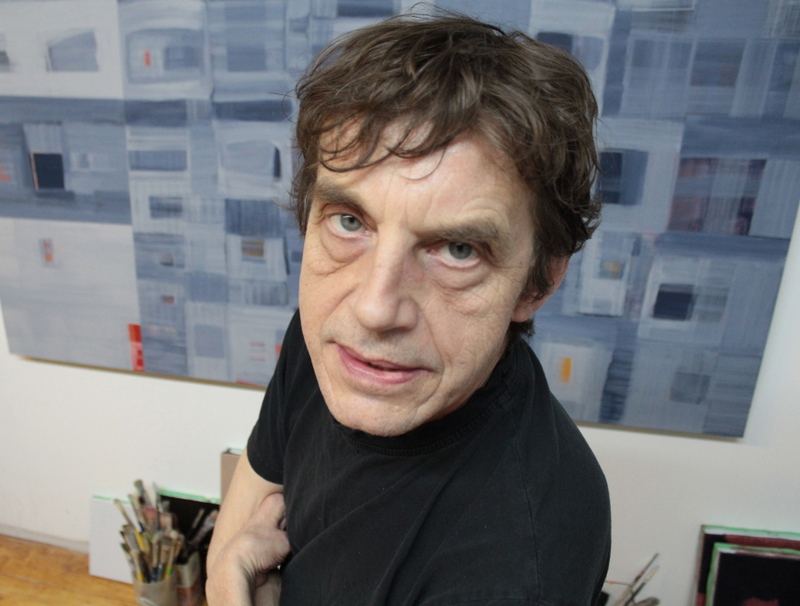 Deverell has been exhibiting his work since the early sixties, primarily in NYC, where he was living at the time. 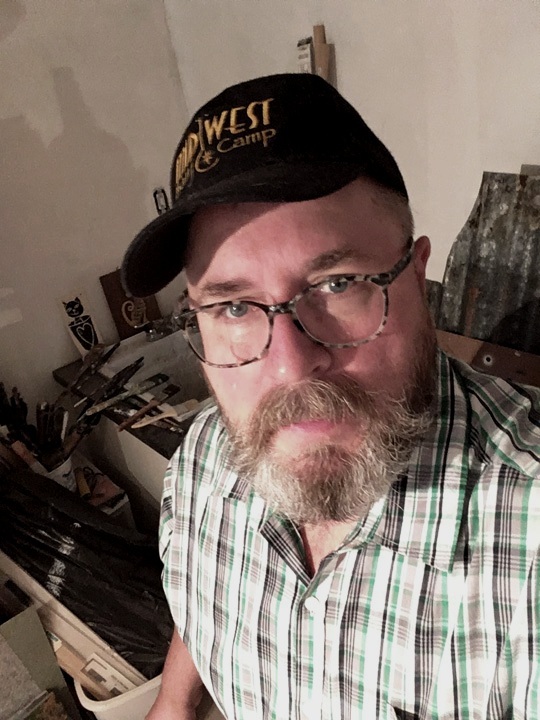 A member of the Arts Student League NYC, his exhibitions have been widely reviewed in such publications as Art News, NY Times, Herald Tribune, Arts Magazine and Art Forum. Returning to Canada in the seventies, he has continued to exhibit work in Toronto, Vancouver, and New York City. Gallery Artists Group Show "Adios Amigos - Farewell to 101"
Selected works by gallery artists: Robert Chandler, Christopher Kier, Peter Templeman, Y.M. Whelan, Tim Noonan, a.k.a. yum, Eugene Knapik, Erin MacKeen, Joe Rosenblatt, Tim Deverell, Lee Lamothe and Deirdre Tara Whelan. This will be yumart's final exhibition at 101 Spadina Avenue before moving to our new location at 401 Richmond Street West. Using found imagery from magazines, posters and scraps of printed matter, Lamothe creates dark and mysterious digital collage. The resulting photographs are printed in a small edition of three each. With a nod to film noir, each image tells a haunting and elusive story.